In a move that probably isn't surprising anyone, Blockbuster Video has filed for bankruptcy. Despite the fact that Blockbuster Video recently announced its new mail-order system for videogames, its financial future still seemed to be on shaky ground. It seems that the predictions made last month were right-on, seeing as how the company has officially filed for Chapter 11 bankruptcy protection. 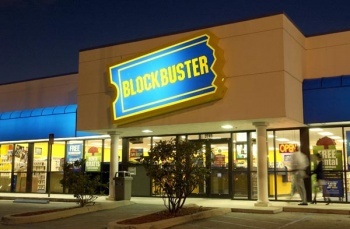 Up to this point, Blockbuster has been facing over $900 million of debt. Now that it's filed for Chapter 11, Blockbuster revealed that it plans to turn itself over to creditors, as well as reduce its debt by approximately $100 million when it comes out of bankruptcy next year. The company has also revealed that it plans to close up to 800 stores; this is on top of the 1,000+ stores it's already shuttered. At the moment, though, around 3,300 stores are still operating around the country and employs over 25,000 people. According to CEO Jim Keyes, this is "the optimal path" for the company. "At this point it might be too little, too late," Mary Ross Gilbert, a managing director at Los Angeles-based investment bank Imperial Capital, told the Wall Street Journal. "They needed to take their mail-subscription business and evolve it to a streaming service. They needed to enter into consumer-electronic arrangements-it's not as pervasive as it should be. Why did they wait so long and stay on the retail platform instead of evolving with the rest of the world?" Blockbuster's management might be being a little too optimistic about how the company's going to turn itself around. Even if it can shave $100 million off its debt, that still leaves $800 million to go, as well as the problem that a lot of people don't really want to go to its stores any longer.